Up until the spring of 2016 I was a strong successful business woman. I had an excellent job, and a wonderful family. I was an avid tennis player and sports enthusiast. I was the person in the room who was outgoing, confident and unafraid. If someone said they had anxiety or panic, I rolled my eyes and thought “get over it”. I imagined an anxiety sufferer as someone worried that the sky would fall. I couldn’t understand what the anxious person feels and didn’t bother to learn, until it happened to me. April 2016 we were going on a beach family reunion. The week before the trip I developed a toothache. The dentist confirmed I needed a root canal. The procedure happened two days before the trip. The root canal did not go well but I went on the trip anyway. I was in terrible pain. We drove nine hours from Florida to North Carolina and I was increasingly miserable. After arriving, I had my first panic attack. Like most people, I had no idea what was happening and was rushed to the Emergency Room thinking I was dying. The hospital told me I was in a panic from the pain. I had emergency dental surgery two days later while still on vacation. By the end of the week I was a mess. That was the beginning of my journey with panic, GAD and depersonalization. I had no idea what was happening to me. I went to tons of doctors, a few psychiatrists and had every test imaginable including brain scans and tests for very rare tumors. How could a root canal gone wrong cause this? How could all these physical symptoms be from anxiety? People like me don’t get anxiety, it had to be something else. Every doctor said the same thing. It was GAD and if I would take whatever pills they handed me, I would be fine. I was always afraid of meds and wouldn’t take them and didn’t believe the doctors anyway. By July 2016 I was pretty much housebound. I worked from home, gave up all sports, and wasn’t even a person anymore. I was a shell, a ghost. Nothing seemed real to me, it was like a thick piece of glass was between me and the world. I couldn’t look anyone in the eye, couldn’t breathe, would stutter, and forget what I was saying, somehow lost my sense of taste and had lost over thirty pounds. Anytime I left the house I had to have a blood pressure cuff, thermometer, finger pulse checker and a Fit Bit that I was addicted to. I used these devices constantly, all day and I would even wake up in the night and check my vitals. My husband dragged me to a friend’s birthday party promising me we would leave when I wanted to. About five minutes in I was ready to go. He wouldn’t leave and I had a full-on meltdown in front of everyone. 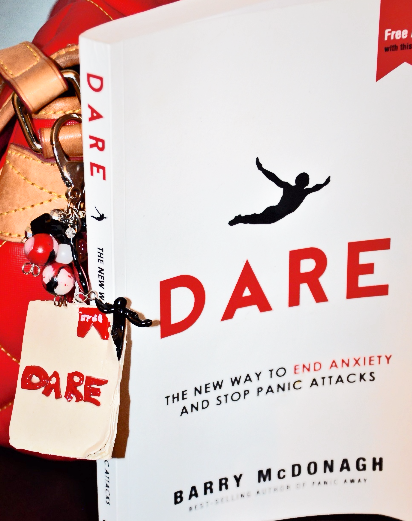 A woman at the party had the DARE book in her car. She explained that panic hit her after her second child. She let me borrow it and I tore through the book that night. I didn’t even know depersonalization was a thing until I read the book. That was the start of my journey. I committed full on to the DARE program. The first thing I had to tackle was my crippling medical anxiety. In the book, Barry writes “so what if I die, so what if I’m sent away.” I was at the point where I didn’t want to live like this anymore, so I had nothing to lose. I looked over my medical bills and wrote down every symptom and the date that I went to the doctor. I had a huge list. I started with my breathing issues. I knew I could breathe but never felt like I could take a breath. I used the DARE approach by reminding myself that I was alive and this was just in my mind. I started holding my breath, puffing my cheeks big and then when I couldn’t stand it anymore I would push out the air using my hands and making a big noise. I would do this on and off for a while, sometimes saying to anxiety “is this what you want, you want to not breath”. Of course, my body would take over and I would start to breathe again. I would look in the mirror and tell myself that I loved me just the way I was and then walk away. The hardest part was forcing myself not to use my devices. I put them in a closet and used every bit of inner strength not to pull it out. Another symptom that I worked on early on was the tingling. It was in my lips and around my mouth as well as my limbs. To diffuse I reminded myself that tingling was no big deal. I would think of all the tests I’ve had and how nothing turned up. For the run toward part, I would step into the shower long enough to get my face and body wet. Then I would sit on a towel on the floor and let the cool air hit my skin. I wouldn’t dry off. The cold air on my wet skin would cause the skin to have the same tingling sensation that I felt on the inside. I would challenge my body to figure out where the tingling was coming from. It seemed to confuse my mind in a positive way. After a bit I would dry off and go do something else. For the rapid heart rate, the high blood pressure and the heart palpitations I would just sit and allow it. I knew from many medical tests that my heart was healthy. It was hard not to pull out my devices but my determination to heal overruled the need to check my vitals. I would log the symptoms and the date/time. Keeping a log allowed me to see how many times I had these symptoms and rationalize that I was still alive so it must be a false alarm. As time went by and I was no longer afraid of my heart or breathing, new sensations appeared. To combat this I created funny looking characters for all the different symptoms. In the beginning, I had twelve characters which represented everything from depersonalization to twitching. When one sensation was strong, I pretended that all the characters would have a meeting with the one acting up. I spent most of the summer going to Florida theme parks, walking, swimming and making myself be part of the real world. One of the most successful practices I used from DARE was changing thoughts from negative to a positive. Intrusive thoughts hit me constantly. If it wasn’t about a family member getting harmed it was about my physical health. A thought would pop into my head, I would be filled with dread and my stomach would drop hard. Heat, sweat and the pounding heart would follow. My mouth would fill with a horrible metallic taste. It would wake me from a sound sleep, hit me in the shower, it was all day and night every day and night. I couldn’t escape my own mind. With absolute determination and full believe that if this program worked for others, it would work for me, I followed the DARE steps. As time went by I had success in combating these thoughts and really start the healing process. In the book it says thoughts are harmless. Just say “so what”. I did just that. I kept a log of each and every intrusive thought. One would hit, I would mark it down, acknowledge it, and then replace the image with something that made me feel good. I love cake so I chose a slice of chocolate birthday cake. At first I carried that red journal everywhere. I had hundreds of entries a day. 5:00am-death of loved one, fake thought, cake. 5:02am-death by poison from water I just drank, still alive, cake. 5:15am-my vision is failing, cake. I also would set goals, today I will have less intrusive thoughts than I did yesterday. Today I will not react when my heart explodes. I celebrated each victory and never allowed myself to feel defeat. I was only competing against myself, so I couldn’t lose. Defuse-The image of cake was used to defuse the thought. Accept-I acknowledged the thought but understood it was just my imagination. Run towards-I would think; ok if its poison hurry up because I want to go back to bed if I don’t die. Engage-I would play video games, do puzzles, legos etc, until I felt better. It took me three months before I could see real changes. The big milestone for me was in mid-October. Our area was preparing for a hurricane and we had to evacuate. Even with the fear, I purposely left the house without my devices. I was no longer using them, but I was still carrying around in a box. It was the first time I was away from home with my crutches. By the end of October, I could travel again go shopping, work at the office. I was becoming the person I was before. When I look back on the journey, really good things happened because of anxiety. A much better and happier person grew out of the shell that I was. I was much kinder, more understanding of others. I lost weight, and took more time for myself. Suzane always says to find a hobby for the engage part of DARE. One time in the middle of the night during a bad panic phase, I was sitting by myself in the kitchen. The kids had a box of clay and I started sculpting all the characters I created for the different sensations. By the morning I had bunch and it shocked my family. Nobody including me knew that I was artistic. I bought more clay and started making charms for my purses with different famous icons. I did some Disney ones and posted it on one of the forums. Immediately people wanted to buy them. This Engage hobby has now turned into something where people are placing orders and I have a backlog. I’m doing about six a week and people love them. If it wasn’t for anxiety and DARE I would have never discovered this talent. The picture above depicts my much loved and worn DARE book. The person is flying free out of the pages because DARE has freed me from anxiety. I am so thankful for Barry. I went to so many kinds of doctors and spent so much money. The cure turned out to be an inexpensive book found on Amazon, written not by a doctor but a fellow anxiety sufferer. Couple that with a forum full of people in various stages of recovery who cheer you on at every stage and you have the key to living an anxiety free life. Wonderful story of a braved person seizing her life back with new purpose. Oh wow. I familialise myself with these symptoms .even if am better now I still struggle with anxiety but not like before. Its a matter of time and am sure I will fly like an eagle. Wow. I can so relate. I felt the same exact way about “other people” with anxiety. Same words would come to mind. I would think, just deal with your issues and get on with life! Little did I know, I soon would have to eat those words. One night I woke up in pure panic, due to a gallbladder attack. Went to hospital by ambulance and all. Ever since that night in 2014 I’ve been plagued with anxiety. I’ve spent so many hours wondering if my gallbladder is not there to flare up anymore, why can’t I just push the reset button and get back to my good ol’ self?!? Its so exhausting and depressing. but after reading this post, I feel like maybe there is a light at the end of this tunnel called anxiety. So thank you Sherri, thank you for sharing your story with us and giving us hope. Great story that i used to relate to. im in a much better place now. People can definitely overcome anxiety even without meds. I know how scary it is thinking you might die at any moment or be put in a mental hospital. Ive read the DARE book and another excellent book that helped me tremendously was the Bible. There is hope and you will start feeling more like your old self and better! Wow this is truly amazing Journey thanks so much for sharing it with everyone so pleased you found Dare. And anxiety has look what it does , it shows us the good comes out of bad. Wow Sherri! What a wonderful story! I am truly and utterly impressed and so happy for you that you managed to pull through. This also gives me hope that I can do it. Thank you for sharing your story! ?? WOW what an amazing story Sherri!!!! Thanks for sharing and for the inspiration!!!! I am so happy for you. Your recovery story is amazing and very detailed. I’m glad you got your life back. Enjoy it to the fullest. Thanks ladies I too am going through this now the panics sometimes lasts all day I’m on medication for my attacts and it addictive & I’m really having a hard time! I really want to overcome this… Sherri you told my whole story, so if anyone can help me it will be very much appreciated ??? Thank You!!! Gives all of us so much hope. I will use your “Cake” if you don’t mind!! Exactly what I needed to read this morning. I too have lost 30 pounds. Blessings. Heey, thanks a lot for the inspiring story! What was really useful for me was DARE’s advice to have a small rock to trap your anxiety in and take it with you everywhere. That’s why I believe the characters you made are really great! I am very interested to buy or even see them, is there any website you’re using to sell? Your story helped me so much. I am so afraid to start my Dare book. 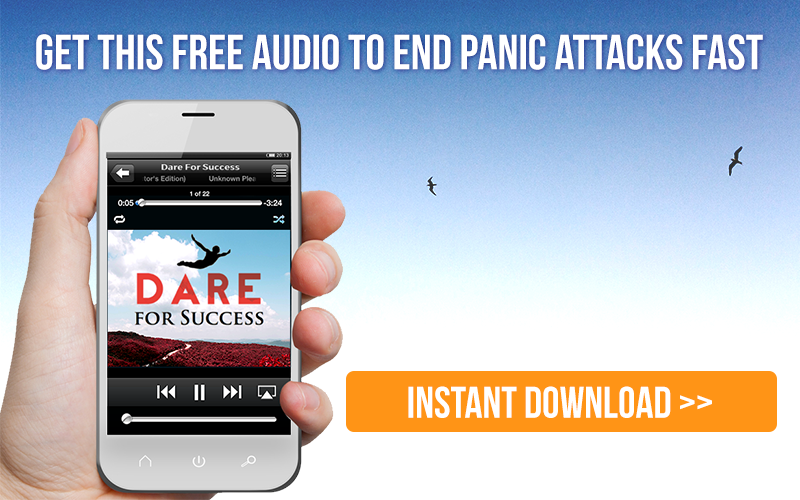 I had panic attacks that Dare app helped me with. But I now have ringing in my left ear. That won’t stop. So the tools of DARE I am afraid won’t help that and I’ll feel more out of control when I realize I am stuck with this noise in my ear no matter what I do. But I will make the jump and pray it will help me live with this and not feel like I am going crazy. I want my life back.